Apart from three distinct needlepoint works, the majority of Rosika Desnoyers' exhibition at Art-Image (from 18 January to 10 March 2019) is comprised of black and white reproductions of pages from Pictorial Embroidery in England, her critical history of needlepainting and Berlin work just published in February by Bloomsbury Visual Arts and available for consultation at the gallery. The exhibition can be understood more generally as a kind of expanded book launch. With discrete and concrete elements of the publication on display, Partridges offers an immersive experience of the text as well as a primer on the artist’s practice as it is linked to her research and scholarship. Rosika Desnoyers, Partridges (detail), 2019. Installation view of the exhibition at Art-Image. The exhibition as a whole addresses the very limits of the capacity for display methodologies to convey information, and this is done most compellingly where absences are made visible. For example, a black monochrome needlepoint reproduction of Partridges can only be fully ascertained at oblique angles, where the figure can be seen in relief. As the booklet for the exhibition heeds the viewer: “Approach so that you can appreciate the work of the artist.” The complete text of my review of the exhibition was published here on the February 27 Akimblog. Adrian Göllner’s latest body of work, All the Birds I Saw Last Year, had its debut in an exhibition at the Central Art Garage, running from September 20 to December 22, 2018. 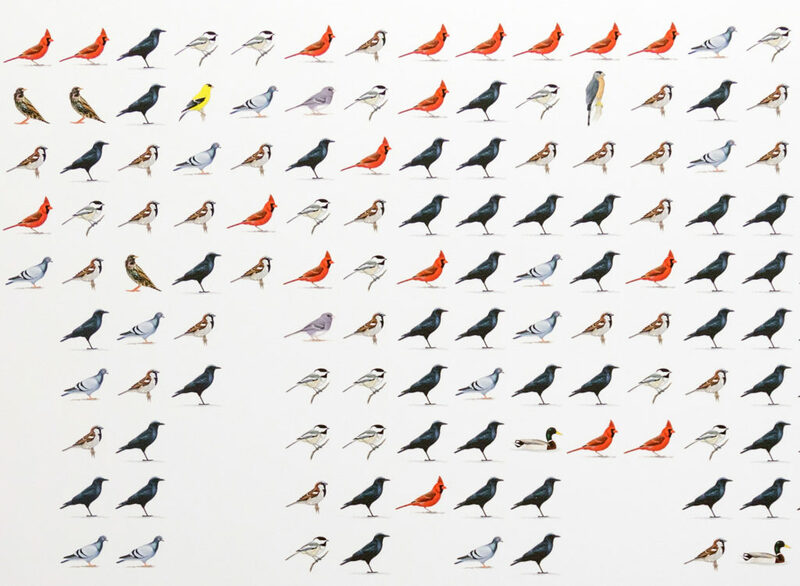 The installation tracks the number of birds the artist observed and recorded on his cellphone in the course of his day-to-day life in Ottawa (with added excursions to Cuba, Nashville and Victoria) from September 2017 to September 2018. The result is an exercise in conceptual ornithology that draws critical attention to environments both inside and outside the gallery. Adrian Göllner, January (detail), 2018. Ink-jet print, 81.2 x 83.8 cm. Photo: Julia Martin. 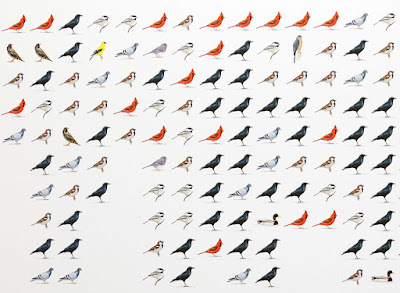 In keeping with the concerns and systematic rigor of Göllner's previous work, All the Birds I Saw Last Year also has political and environmental connotations—Göllner’s yearlong count added up to a little more than 14,000 birds, suggesting a precipitous decline since Audubon’s time—but the inclusion of naturalistic representations of birds anchors the conceptual abstraction of its raw data and lends the work a broad appeal. Click here to read the complete text of my review of the exhibition which was published on December 13 by Canadian Art online. In a career that spanned four decades, the artist Alootook Ipellie combined aspects of southern Canadian colonial culture with Inuit culture in a complex process that he described in a poem as “walking on both sides of an invisible border.” A retrospective exhibition at Carleton University Art Gallery takes its title from that poem, which is displayed along with other published and unpublished material by the artist to provide a well-rounded portrait of Ipellie and his achievements. Curated by Sandra Dyck, Heather Igloliorte, and Christine Lalonde, the exhibition presents selections of Ipellie’s output as an accomplished journalist, author, poet, illustrator, cartoonist, and artist from the 1970s until his death at the age of 56 in 2007. The title poem’s description of Ipellie’s process places it somewhere between a method of torture and a choreographed dance routine, and demonstrates the seriousness and sense of humor that the artist brought to his work. The exhibition succeeds in representing the breadth of Ipellie’s activities as a visual artist, a literary artist, and more. It fittingly spills over into a satellite exhibition in Centretown at the Manx Pub where a selection of drawings for his comic strip Nuna and Vut, curated by Danielle Printup, is on display. The complete text of my review of the exhibition was published here on the October 10 Akimblog. Àdisòkàmagan / Nous connaître un peu nous-mêmes / We’ll all become stories, curated by Rebecca Basciano, Jim Burant, Michelle Gewurtz and Catherine Sinclair for the Ottawa Art Gallery, has a trilingual title in Anishinābe, French, and English that doesn’t exactly translate word for word. Instead, it signals that the artworks on display are culturally distinct. With a deliberate focus on art-making in the Ottawa-Gatineau region, this exhibition encompasses a vast span of people and time – from a copper point made about six thousand years ago to eleven new commissions that debuted at the opening in April. The exhibition runs from April 28 until September 16, 2018. Ultimately, the exhibition presents a portrait of Ottawa composed of the artists who have roots here, including both well-established names and those who are lesser known. It gives visitors a chance to get reacquainted with old favourites and to make discoveries. Someone who doesn’t live here might be surprised to learn that the city has the largest population of Inuit outside of the Canadian North. 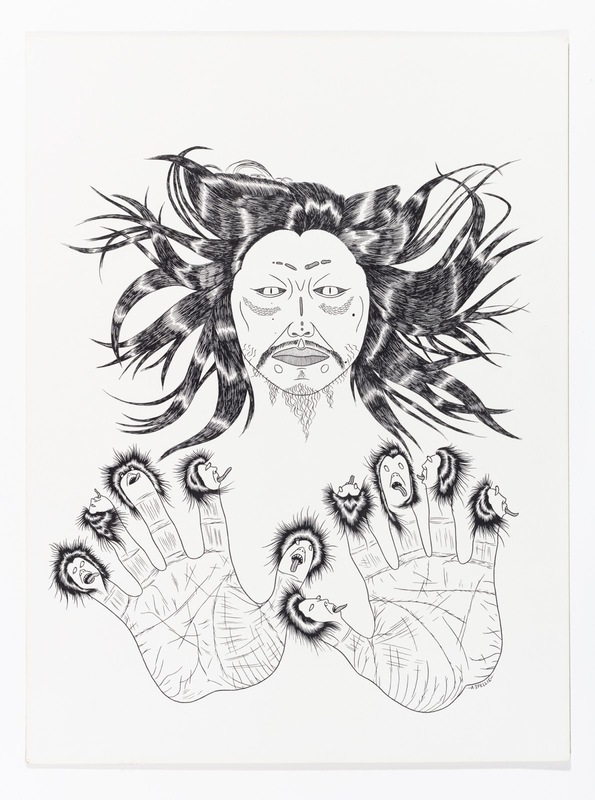 This is well reflected with works by artists such as Mattiusi Iyaituk, Henry Kudluk, and Annie Pootoogook. Barry Pottle’s photographs I,U,A isolate the shapes of Inuktitut syllabics found within the concrete angles of the streets and strongly assert an urban Indigenous presence. Àdisòkàmagan / Nous connaître un peu nous-mêmes / We’ll all become stories contains not only a wealth of stories but also different ways to tell them. The complete text of my review of the exhibition was published here on the June 6 Akimblog. It is my latest Akimblog post, since Akimbo resumed publishing reviews from its Ontario regional correspondents in the spring of 2018. 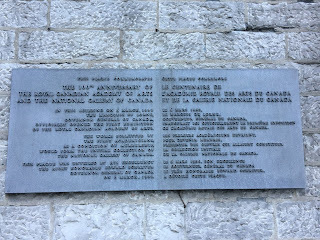 On the side of a building on the corner of Sussex Drive and George Street in the Byward Market in Ottawa, there is a plaque that commemorates the 100th anniversary of the first exhibition of the Royal Canadian Academy of Arts (RCA). The building at that address, 541 Sussex Drive, has a complex history. It started out as a tavern in 1827 and over the years it has been a number of hotels; a military barracks; the Geological Survey of Canada; the Department of Mines; and a dental clinic for the Royal Canadian Air Force. Since 1998 it has housed an advertising agency. Although the architecture is of an era, the social history of the building is not visible to the eye from its façade, save for the plaque, which was put up in 1980. Marking the centenary of the date 1880 when the RCA was founded, the plaque only refers to that brief moment in the building’s existence when it was used for the exhibition. It was an early “pop-up” exhibition, really, since the Geological Survey of Canada would move in soon after the event. And though the exhibition might have been ephemeral, its legacy encompasses far more than just this one historical marker. 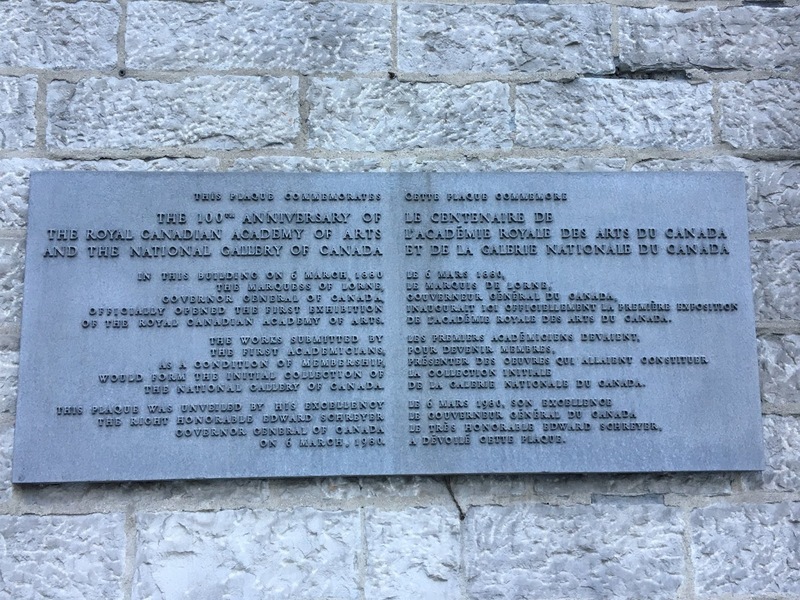 Any reader of the plaque would know that the works in that first exhibition, donated by the first academicians as a condition of their membership, would form the initial collection of the National Gallery of Canada (NGC). Of course there is a long history to be told here, not just of the building but of the RCA and the NGC. Undoubtedly that history would reflect the attitudes of Canadian society from its colonialist beginnings. However, it is important to emphasize that the RCA has had the mandate to support and promote contemporary art in Canada from the start. Today the honourary organization counts over 790 members and is comprised of professional artists, architects and designers from all across Canada, with approximately 30 of them living in the Ottawa area. Book Marks is a pop-up exhibition that brings together recent and notable publications featuring Ottawa members of the RCA. The RCA has made an indelible mark on the history of the cultural landscape in Ottawa, and the exhibition provides a glimpse of the ways that the current Ottawa-based members have been actively contributing to its future. Like the historical marker that brings the activities of the RCA 138 years ago into the present, the publications on view in Book Marks index the activities of the current Ottawa membership of the RCA. An index is a handy tool that makes certain content visible, accessible, and easy to find, isolating it from a mass of other information. If you look at the index at the back of a book, you find an alphabetical list of names and subjects and the page numbers on which they appear. An index is literally a sign that points to something, like an index finger, to make it known. This exhibition acts as index of the current membership of the Ottawa-based RCA members. Although it isn’t comprehensive, it offers an opportunity to reflect on how the practices of the Ottawa members of the RCA, in multiple ways, create their own indexical relationships with the world. My focus on the notion of indexicality in the works of the Ottawa members of the RCA is inspired by a canonical text in art criticism, Rosalind Krauss’s two-part essay “Notes on the Index: Seventies Art in America,” first published in the journal October in the late 1970s. Krauss takes the concept of the index from Charles S. Pierce’s theory of semiotics, especially with reference to its description of the indexicality of photographs, and applies it to come to an understanding of then current trends in contemporary art. For Pierce, an index is a sign that has an existential relationship with the thing it represents, a physical trace that is directly connected to the person or thing making it, such as a footprint, or a fingerprint. 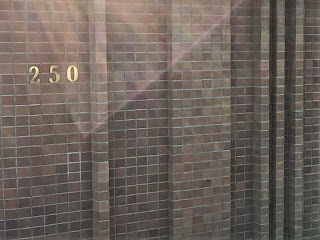 Photographs are understood to have this connection due to the process by which they are made, the registration of light reflecting off of the subjects depicted. Krauss’s essay doesn’t dwell too long on this aspect before it transfers the notion of the indexicality of photography to sculptural installations. The examples she provides work as indexical signs in terms of their self-referentiality because they point to themselves as the very thing that they signify. For example, in East/West Wall Memory Relocated, the artist Michelle Stuart took rubbings of sections of a corridor wall on floor-to-ceiling sheets of paper, tracing the wainscoting, cracked plaster, and other surface elements. She then installed each finished sheet on the facing wall. In this instance the work refers directly to the location from which it has been taken, but it has been slightly displaced, temporally and physically, thereby opening up a space for contemplation. By transposing the notion of indexicality from photography to sculpture, Krauss transforms sculptural installation into a kind of cinema, or a series of indices (still images) that viewers activate into a narrative as they walk through the space in which it is situated, such as the corridor in which Stuart’s rubbings are located. I’m not sure if this is a rigorously logical application of the concept, but it works for me as a metaphor for the sequence in which viewers of a work of art interpret its meaning. As Martin Lefebvre reminds us in his essay “The Art of Pointing,” art writers tend to be the worst abusers of the concept of indexicality in photography because they obscure the fact that in Peirce’s semiotics every sign contains the characteristics of index, icon and symbol. It’s just easier to see the indexical relationship or imprint between the photograph and the thing it represents. Drawing from various instances of photography, architecture, public art, and publications produced by the Ottawa members of the RCA, I will explore the manner in which indexicality plays a part in just a few selections from the “Book Marks” exhibition. Thinking of indexicality in the practices of the artists in “Book Marks,” it makes sense to begin with the photographers. There are a good number of them in the current members of the RCA in the Ottawa area, and these include Robert Bourdeau, Rosalie Favell, Lorraine Gilbert, Marie-Jeanne Musiol, Jeff Thomas, Justin Wonnacott, and Andrew Wright. Through their practices, these artists continue the long history of photography in Ottawa. Since Canada is a relatively young political construct, the invention of photography actually predates confederation by 28 years. The Canadian government was quick to recognize the value of documentary photography as a nation-building tool. In 1861 Samuel McLauglin became the first official government photographer in the Department of Public Works for what was then still the Province of Canada, when he was commissioned to photograph the construction of the Parliament Buildings in Ottawa. In “Another Place, at the Same Time,” Gabrielle Moser writes eloquently about how the evolution of colonialism and photography has been intertwined. She writes, “However different their stylization and subject matter, colonial photographic projects shared the same all-encompassing world view: a belief that space could be objectively captured by the camera, sorted into filing systems, and archived as empirical knowledge”(59). A similar argument could be made about the way that photography has been used by the Canadian government, reflected in the activities of institutions such as the National Gallery, the National Film Board and the National Archives, whereby a territory has been claimed through its representation. In “Notes on the Index,” Krauss makes reference to Roland Barthes’ notion that the indexical photograph is a “message without a code” in order to show how photographs invite supplementary captions to fix their meaning and their use. The artists in Book Marks are surely aware of this history of the use and abuse of photography, as they have actively engaged in dialogue with it. As shown in the catalogue for her retrospective exhibition, Canadian Landscapes, Lorraine Gilbert has made a career out of photographing landscapes in order to question colonial exploitation and occupation of the land in Canada. Her work, Eagle’s Nest, Bancroft (2012), through subtle digital manipulation, shows the ongoing commercial and colonial encroachment on the land, as Tim Hortons become fixtures in the picturesque wilderness of Algonquin Park. Similarly, Rosalie Favell has undertaken the massive and ongoing photography project, Facing the Camera, which is comprised of portraits of Native American and Indigenous artists and arts professionals, as a means of making visible the community with which she identifies. Writing about Favell’s project, Steven Loft argues that it comprises “a visual repudiation of colonialist histories” and is “what Jolene Rickard has called ‘the documentation of our sovereignty’”(9). These two examples show how contemporary artists in Canada have been working to produce narratives that question the processes and the outcomes of the colonial project. Although photographs have done much to shape our perception of the cultural landscape in Canada, architecture and public art installations comprise actual physical interventions in it. The Ottawa membership of the RCA has certainly made a distinct contribution to the built environment or cityscape of Ottawa, and there would be another long history to tell that definitely falls outside the parameters of this essay. Current member architects include Tony Griffiths, Barry Padolsky, John Cook and Douglas Cardinal. Thomas Fuller, architect of the original Parliament Buildings, was one of the first members of the RCA. Another RCA member, John A. Pearson, redesigned the Centre Block after a devastating fire in 1916. The juxtaposition of this iconic building with another in the National Capital Region reveals a contrast in visions. On the other side of the Ottawa River, directly opposite that iconic seat of government that has been referred to as “Westminster in the wilderness,” lies Douglas Cardinal’s Canadian Museum of History. As detailed in his book, Design Principles: Canadian Museum of History, Cardinal proposes that the building, completed in 1989, represents a vision of a later era in Canadian history that redefines, in dialogue with Parliament Hill, what can be achieved when everyone in Canada works together to attain a common goal. With the contribution of colleagues in his architectural firm he writes, “The Museum organically harmonizes the Canadian landscape with its cultural heritage and represents the uniqueness of Canada as a place where emigrant nations from all over the world meet, blend and learn to thrive with the Aboriginal inhabitants.”(83). Krauss’s essay offers an intriguing model for the interpretation of sculptural installation – and by extension, the architecture it activates –through its indexicality. My reading of these two buildings has probably more to do with their symbolism, but each does act as an index of an historical era. Side by side, they are like still images in a time-lapse film narrating the construction of a capital city. 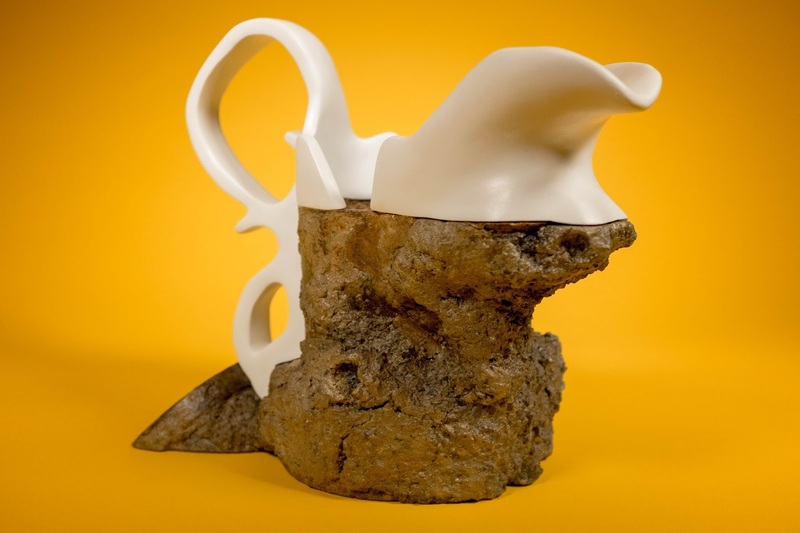 The sense of two time periods that arises through their proximity suggests to me that the sense of indexicality results from a physical disruption that prompts awareness and leads to an interpretive act. The sense of discontinuity the index inspires may become more apparent through the citation of some examples of public art by Ottawa members of the RCA Members in Ottawa. Jerry Grey’s first public mural commission, The Great Canadian Equalizer (1979), as described by Susan Crean in her catalogue essay for On the Grid, can be seen as an interpretive gloss on the activities of Statistics Canada. Located in the very building which houses that government agency, the mural articulates the artist’s vision for a society that promises “equality built on difference”(59). 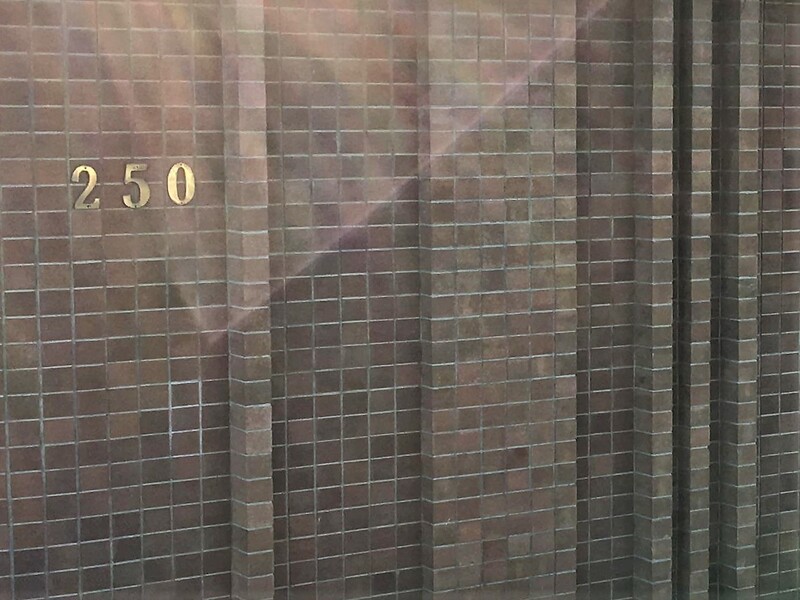 Adrian Gollner’s project Modern U (2003) installed temporary signs featuring abstract symbolism on buildings throughout Carleton University’s campus in order to inspire the viewer to learn more about the architectural history there. In both works, the art installation leads the viewer from a physical encounter with its site to a meta-narrative or interpretation of its meaning, in a process by which unapparent aspects of it are made known. Anyone who wishes to learn more about the installation of public art in Ottawa has a great resource in Justin Wonnacott’s Pictures of Art (2017). In a seemingly quixotic undertaking, Wonnacott has obsessively photographed hundreds of instances of public art in the National Capital Region. The empirical or encyclopedic impetus of the project is undercut by the partial views and idiosyncratic choices Wonnacott makes, but it is perhaps the most categorically indexical example I have listed yet. Indeed, the publication, which is the most readily accessible element of the project, does include an alphabetized index of the artists whose works are featured. Each instance is photographed in situ and supplemented by the artist(s) name(s), title, date, materials and location of each work so that a reader could track it down if so inspired. The same questions that drive him to make these pictures, such as “What is it for? Why does it look like that?” are likely to be asked the readers of the book (7). A thorough perusal of the series is revelatory, particularly for anyone who has walked around Ottawa and wondered about the public art, both good and bad, that is in full view. For example, I’ve often wondered about the piece “Canadian Shield” that adorns the Ottawa Courthouse and didn’t know that it was made by the artist collective General Idea until I saw Wonnacott’s book. I’ve also passed by a mysterious building on Durocher Street in Vanier without ever noticing or guessing that current RCA member Duncan De Kergommeaux had contributed a brick mural to it, employing a minimalist aesthetic similar to his more well known paintings. These disruptions of my environment, aided by Wonnacott’s indexing them, contribute to a deepening of the narrative that I can make out of it, like a movie in my mind. Finally, it is important to remember that first and foremost, language is comprised of signs too, so books also bear the qualities of indexicality. I’ve been talking about photographs and architecture and public art for the most part, but I’ve also made reference to the publications in Book Marks that document these items and make them public. I should also mention that several of the RCA members are graphic designers who work on the production of such books. This exhibition provided the opportunity to exhibit the rare and coveted Donald Judd catalogue designed by Eiko Emori for the National Gallery of Canada. At a public talk that she gave about her design work, I also saw the invitation that Emori designed for the exhibition, which made reference to the fact that a bagpiper formally opened the reception. Through this bit of ephemera, I discovered that Judd was a bagpipe enthusiast and hired them for such occasions after first encountering them on a trip to Canada. In Index, a retrospective look at artist and designer Robert Tombs’ work, I made the observation that a comprehensive history of contemporary art in Canada has been written, and that it resides in the innumerable little publications that have been produced to tell it. Given that it is within the mandate of the Ottawa Art Gallery (OAG) to focus on and support the Ottawa art community, it is not surprising that many OAG catalogues can be found in this exhibition. Nor is it surprising that a good number of the current Ottawa-based RCA members can be found in the grand opening survey show at the new OAG, Àdisòkàmagan / Nous connaître un peu nousmêmes / We’ll all become stories. Publishing is an important way that artists can have their work made public and institutional support is a crucial aspect of the sustenance of their careers. This is not to say that artists don’t advocate for themselves when there is a lack of institutional support or interest. In fact the OAG came into being as the result of the advocacy of local artists. Taken together, the publications on view in “Book Marks” tell a story about contemporary art in Ottawa. It is not complete by far, but it does indicate the significant contribution made by local members of the RCA. With reference to Krauss’s essay and her evocation of Roland Barthes’ theories about photography, I am compelled to apply a sense of the future-orientation of the sign to the items I have discussed and those that are on view in the exhibition. In Barthes, there is an immediate slippage in the snapshot of a scene from the sense of its being there to its having been there, or as Krauss puts it, the indexicality of the works she describes achieve “the paradox of being physically present but temporally remote”(65). This is generally understood as an evocation of the past, even in the present. Through an artist’s architectural intervention, such as Stuart’s wall rubbings, a building is brought into the viewer’s consciousness almost as if in the form of a ghost of itself (Krauss 65). However, I would say that this uncanny feeling arises from that fact that it is not the building that becomes a ghost in that moment of awareness, but the viewer. There is an element in the sign, be it a photograph, a work of art, a book, or an historical plaque, that remains sealed like a time capsule, intended only for a future audience. Cardinal, Douglas. Design Principles: Canadian Museum of History. Gatineau: Canadian Museum of History, 2016. Crean, Susan. “Journey to the End of Art.” Jerry Grey: On the Grid 1968-1978. Ottawa: Ottawa Art Gallery, 2016. 54-60. Davidge, Michael. “The Telling Detail: Robert Tombs by Design.” Robert Tombs: Index – Graphic Works 1985 – 2015. Sackville: Owens Art Gallery, 2015. 121-126. Gilbert, Lorraine. Paysages Canadiens / Canadian Landscapes. Saint-Hyacinthe: EXPRESSION, Centre d’exposition de Saint-Hyacinthe, 2017. Krauss, Rosalind. “Notes on the Index: Seventies Art in America.” October, Vol. 3 (Spring 1977). 68-81. Krauss, Rosalind. “Notes on the Index: Seventies Art in America. Part 2.” October, Vol. 4 (Autumn 1977). 58-67. Lefebvre, Martin. “The Art of Pointing. On Pierce, Indexicality, and Photographic Images.” Photography Theory. Ed. James Elkins. Abingdon: Routledge, 2007. 220-244. Loft, Steven. “Looking at Me, Looking at You.” Facing the Camera. Winnipeg: Urban Shaman, 2012. 8-9. Moser, Gabrielle. “In Another Place, at the Same Time” In Another Place, and Here. Victoria: Art Gallery of Greater Victoria, 2015. 54-74. 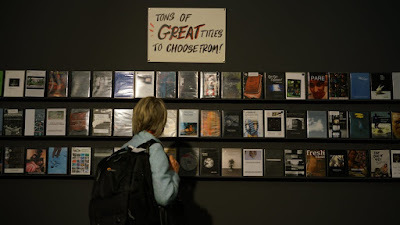 I submitted a DVD copy of one of my videos, Testament (2005), to be included in the Knot Project Space (SAW Video) iteration of Su-Ying Lee and Suzanne Carte's project, Video Rental Store: Under New Management. The exhibition, from April 26 until June 9, 2018, takes the form of the increasingly and/or already obsolescent video rental store, featuring a growing inventory of over 250 artists' videos. Video Rental Store: Under New Management at Knot Project Space. Initiated in 2013, the project may outlast video stores themselves. The hand-lettered signs are a nice throwback to the type of sign that appeared at Honest Ed's in Toronto, another defunct business enterprise. Under New Management’s Video Store is a resolutely non-commercial venture that has a unique rental policy incorporating a pay-what-you-wish with what-you-wish program. The videos can be rented without a membership and are procured from artists through an open call for submissions. Watch for it when it appears in a neighborhood near you. Testament incorporates footage from the classic silent film The Passion of Joan of Arc (1928) directed by Carl Theodor Dreyer. The frame rate expands or contracts depending on whether it is a close-up or establishing shot, in an effort to generate tension and release in the viewer. It has a unique soundtrack, borrowed from the Crosby and Hope Road comedy, Road to Bali (1952). The use of this music was my nod to Antonin Artaud, who appears in the director's cut but who is otherwise absent from my edit of the film. After nine quarterly issues of an online video magazine (www.culturalengineering.ca), the Cultural Engineering project comes to a close with the opening of the exhibition, Addenda, in SAW Video's new project space The Knot from January 25 until March 3, 2018. The artists participating in the project have eloquently borne witness to the historic infrastructural investment at Arts Court that has substantially transformed the downtown of Ottawa and given a significant boost to the stature of local arts organizations. Stationed as critical observers more so than cheerleaders of the undertaking, the two stalwarts of the project, Meredith Snider and Tim I. Smith, have contributed videos to each issue of the magazine since its launch in February 2015. A number of guest artists have also contributed videos, expanding the points of view and adding to the diverse range of topics addressed, including city planning, social justice, Indigenous issues, transgender rights, labour, and the conservation of built history, among others. With the exhibition, the first in The Knot, the Cultural Engineering artists have been given an opportunity to go offline and make a physical intervention at Arts Court. Each artist in Addenda is contributing work that incorporates and transforms materials that have been salvaged during the demolition phase of the Arts Court renovation. In keeping with the structure of the previous online installments of the project, the exhibition includes new work by Snider and Smith, as well as work by guest artist, Mélanie Myers. Addenda is fittingly titled since the catalogue for the Cultural Engineering project was produced over a year ago. Information about the exhibition will actually be found in an addendum to the publication. The title of the exhibition is in the plural form to suggest there are many instances within the exhibition (not to speak of the Arts Court redevelopment itself) where things have been added with an aim towards improvement. One could say that it applies to SAW Video too, since it is only now after 35 years that it has added an exhibition space to its operations. The Cultural Engineering project has demonstrated that city building (and the growth of arts organizations) is an unfinished project that is always open to the redress of historical omissions and to an update in plans.